After 3 years, I am in last year of my college. In three years mom grow again hair. Again mom keep hair up to waist length. Mom just did only trim her hair in three years. Mom did good growth in her job. Recently mom joined reputed MNC company. In that MNC company mom joined as Head of Sales Department. Mom got very good salary package. Mom and me are very happy. One day mom got one deal assignments from her company. Assignments related deal with other company within in month with successful. So its work pressure time for mom. Mom did meet other company’s manager related to deal. That time other company’s ad manager was also present there. That time ad manager offered model role to mom for their company ad. Mom was so surprised and little bit nervous. Ad manager told mom that that’s role suit best on mom. Mom told give her some time for thinking. Then mom told them I accept that offer on one condition. Condition is that I accept your ad offer. Your company accept her company deal assignments. Both of them , company manager and ad manager agree with mom conditions. They signed on deal paper and mom signed ad deal paper. Ad manager gave ad documents to mom. Mom returned home. Mom discussed with me this ad and shoe me ad documents. I read documents. In documents, mentions some conditions. I told mom that conditions. There are twon conditions, one condition is maintain figure and second condition is hair keep up to pixie cut. Mom told me what to do son now, I told mom don’t worry. I take appointment for salon appointment and take gym membership. I took salon appointment on next Sunday. Mom started goes to gym everyday. On Sunday me and mom reached Raj’s salon. “This outlet is a bit different than the other ones you own,” Hava said conversationally. Hava wore blue top and black jeans. Hava made clip ponytail. Ponytail up to her butts. “Yeah, I only take appointments for the selected clients here. The senior stylists take care of the rest in the other outlets.” Raj slowly walked behind her and swiftly began removing the pins, letting the dark waist length hair undone. A rumble of a chuckle came out of his throat. “Let me wash your hair today. You will feel a lot better,” Raj said, directing her the washing area. As Hava plopped herself down on the comfortable leather chair with adjustable inclination, Raj first dampened her long, thick waist length -colored hair and began lathering it up. The slow circular movements he did, massaging . With great care, he washed the hair, blotted the excess water with a soft towel and led her to one of the salon-chairs. Raj brushed the damp tresses very gently with a wide-tooth comb. “How do you feel about a haircut?” Raj probed. “I had a trim last month,” Hava recalled promptly. He gave a small nod and dragged the trolley closer to her chair. The gleaming steel of the scissors, clippers, combs, among other things, were nicely laid out on it. He reached out for the cape first and draped it around her. “What are you doing?” Hava asked, suddenly nervous. “I am giving you a suitable haircut,” he said calmly. Her hair was sectioned into four parts as he held a section of hair in his hand at the back of her head and quickly snipped it off. After working on a few segments, the terrible realization dawned on Hava that he was chopping her hair off at the nape. She tried to turn her head around, but the grip on her hair prevented it. For a long moment, he didn’t answer but kept on snipping until the hair was in the shape of a bob. He ruffled the locks at the back and then slowly stroked her almost-exposed nape. “Do you like short hair, Hava Aunt?” he asked her point-blank. Hava bit on her lips and shook her head. “I won’t look good. It will look funny on me,” she said sorrowfully. “How short are we talking about here?” mom enquired. But I didn’t reply and simply whirled the chair away from the mirror so she could only face him. “That would be my choice,” i told with a smile and winked at mom. Picking up the comb and clippers, I slid the comb above the left ear and ran the clippers straight across, letting the hair fall on her shoulders. A strange stir between the legs made her squirm on the seat as she watched chunks of hair kept sliding down the cape. Then Raj took charge. “You are moving too much, Hava Aunt,” he said in a clinical voice and clamped his hand over her head. He slightly tilted to the opposite side and the snipping began anew. “You will, once I finish it,” Raj reassured, and began working on the nape and above. He kept perfecting the back and sides with a repeated motion of clippers over comb until it was nothing but downy felt covering around her head. 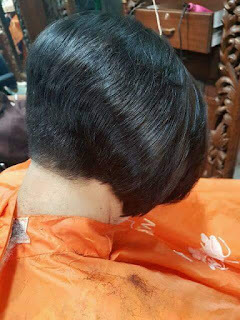 He longed to use the clippers directly on her head, to give the traditional short clipper cut with severe tight taper—which was his forte—but decided against it. It was Hava’s best short cut ever, and something so extreme would throw her off balance. Maybe Raj could convince Hava to go a little shorter for the next haircut session, he thought. A moment later, Raj stood directly in front of her and unpinned the top section, which was the only portion left longer. But the situation was rectified as quickly and thoroughly as possible. Section by section, Raj held the hair between his fingers and snipped them right in front of her eyes. The act was as ruthless as it was thrilling. “Short bangs would suit you well, aunt,” Raj commented, softening the bangs with the thinning shears at the same time. “Uh huh.” That was all mom could manage to eke out. He finally kept all the instruments down and picked up the hairbrush and dryer. With the newly shorn length, it took less than five minutes to dry and set it for a professional like him. “Can I please see it now?” Hava asked impatiently, with her excitement fullest to the brim now. “Just the finishing touch.” The dry cutting began, but it was completed in no time at all. Raj slowly turned the chair towards the mirror as Hava gaped. Hava’s look was completely changed—in a good way. The haircut was something between a pixie and a chic boy cut, and Hava saw how beautifully Raj had customized the look for her. Hava realised her son , he wasn’t kidding when he said that short hair would suit her better.When she finally overcame the initial, a shy smile broke out of her lips. “I can’t recognize myself. It’s beautiful. “Much shorter than this,” I confirmed. “Next time it is then,” Hava said with glee, kissing his scuff cheek. Then me and mom returned home. Mom also completed goal of maintain figure with so much hard work at gym. Next day me and mom reached at other company ad shooting place. There is best ad studio. Then we met ad manager and ad director. Ad director told mom, your looks so perfect as ad model. We appreciate your look. Then finally mom selected for ad. Then completed ad shooting. Ad manager gave amount cheque to mom for ad. Then we returned home. Next day mom went to her office. Company’s management was very happy because of deal assignments was completed within time. Company management appreciated mom work and skills. Company management announced bonus for mom and also gave foreign tour go package. Me and mom was very happy. Me and mom started planning for foreign tour. 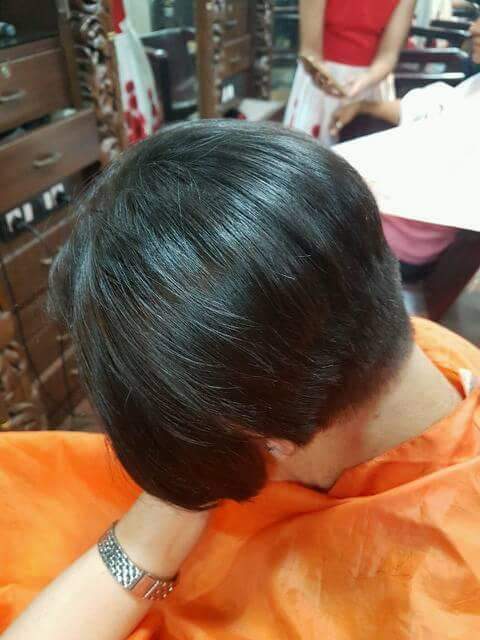 Hope you friends likes my mom haircut stories. If You want more stories related to my mom. Please friends comments. I will write next mom haircut stories parts. I'm glad, you liked it.